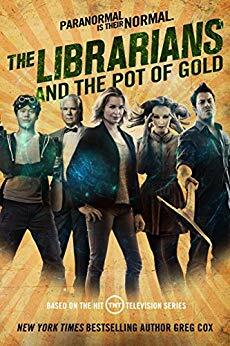 The television series, The Librarians, lasted four years on the TNT cable network and, personally, was one of my favorite shows. I miss it, and thankfully Greg Cox gets one last opportunity to tell a story featuring this wonderful cast of characters. The series mixed myths and legends with magic and intrigue, and was always a constant surprise in terms of storylines. Cox takes a segment from Ireland in the 5th Century and a diabolical organization called the Serpent Brotherhood, combining them into an entertaining reading experience. Cox even throws in the Phantom of the Opera for added fun. Those who enjoyed the TV show must pick up this book, yet those unfamiliar with the franchise will find enjoyment as well. While no new episodes are planned, it is nice to have this book serve as the equivalent of a two-hour adventure. One can only hope that Cox has more stories featuring these librarians in the pipeline. Be the first to comment on "“The Librarians and the Pot Of Gold” by Greg Cox"